Cat owners make many adjustments for their feline friends. Cats are great at hiding, then suddenly reappearing without providing a clue as to where they were. Your cat may be hiding inside your bed's box spring. This is unsafe. If your cat rests under the bed, he can easily run out if the bed is in danger of falling or breaking. Cats cannot exit a box spring as quickly and risk injury if the bed supports break. Fortunately, there are ways to keep your cat out of the box spring. Inspect the box spring for holes. If you want to keep your cat out of the box spring, chances are she already got in. If there is a tear, find the suspected cause. The lining in the bottom of the box spring is usually made out of a thin, fibrous material called cambric. Lift the box spring and stand it against the wall to see how your cat got in. If the tear is near the outer perimeter, it is probably due to normal wear. 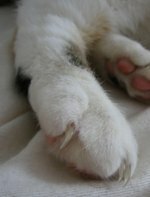 If you don't keep things under the bed and the tear is near the middle, your cat may have made the hole with her claws. Repair the box spring. If the tear is from natural wear along the outer perimeter, use a heavy-duty stapler to staple the lining back to the wood frame. Pull the cambric lining toward the frame as tightly as you can, keeping the material straight. Try to overlap the cambric and staple it to the wood. If the tear is in the middle of the box spring, staple it by pulling both sides of the tear tightly together and stapling the two pieces of cambric together. Install a protective lining to keep your cat out. The least-expensive lining is a high-thread-count fitted sheet, available at any department store. Purchase the same size sheet as your mattress size; most box springs are about the same thickness. If you have a larger budget, buy a thin pillow-top mattress cover as a protective lining. The mattress cover will add extra layers of protection against your cat's claws. Put the sheet or mattress cover over the bottom of the box spring as if you were making your bed. Place the box spring back on the bed frame with the protective lining side down. High-thread-count sheets or pillow-top mattresses are not fibrous and will not allow your cat's claws to grab and tear the material as much as cambric lining. Periodically inspect the bottom of the box spring for tears. How Do I Know If My Parakeet Is Going to Lay Eggs?